As the editorial director of Fine Cooking, I’m frequently asked for cooking advice. I’m happy to engage in these conversations because sometimes I learn a few things, too (who knew you could cook bacon in a waffle iron?). Many of the questions I hear revolve around cooking basics, and my responses are mostly the same. 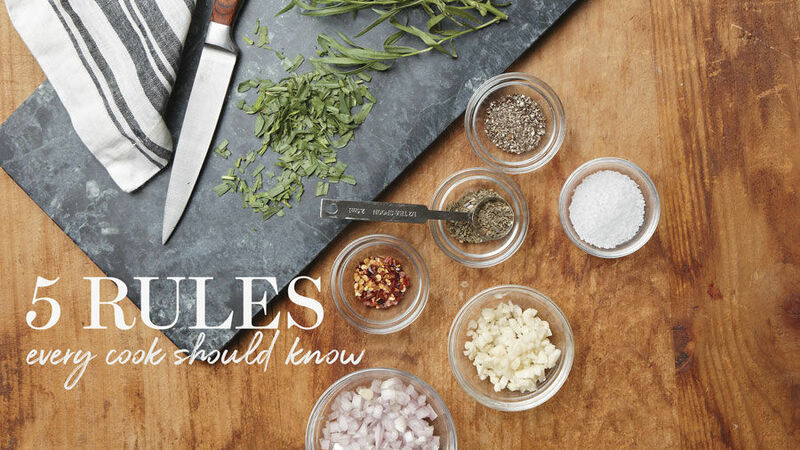 With this in mind, I’ve devised these five rules I think every cook, regardless of skill level, should practice. If you start here, I believe your success rate in the kitchen could improve at best, and at the very least, you’ll enjoy cooking more. 1. Start with the best ingredients possible. Will this make your food taste better? Definitely. Great cooks produce fabulous meals because they use quality ingredients. Sure, a good recipe can produce good results, but your dish will taste only as good as the ingredients that go into it. So get rid of old, expired spices; frequent your local farmers’ market; find a good butcher and fishmonger; buy good olive oil. You’ll taste a difference. 2. Read the entire recipe before you begin. This may sound obvious, but even seasoned cooks will jump into a recipe without reading it first (yep, I’ve been guilty, too), only to discover midway that they’re missing a key ingredient or that something needs to marinate for several hours. These types of surprises can quickly derail your cooking plan but are easily avoided by reading the recipe ahead. 3. Prep ingredients ahead of time. 4. Invest in a good chef’s knife. A chef ’s knife is the most indispensable tool in the home kitchen. It’s the knife you’ll use most to chop, dice, slice, mince, smash, carve, and more, so it’s worth it to buy a good one. Caring for it and keeping it sharp is also important, not only for ease of use, but also because a sharp blade is safer than a dull one. Compensating for a dull blade by adding extra force can be dangerous. You can’t become a good cook without some flops along the way. If your dish fails, don’t despair; consider it a learning experience on the path to being a better cook. Failures happen to everyone, even accomplished cooks, so don’t give up—and remember, takeout is just a phone call away.